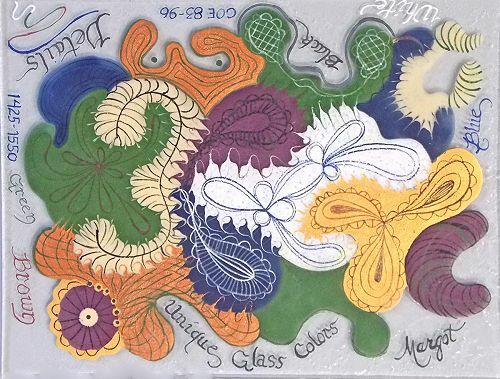 They are high pigment content powders that are mixed with our Medium to the desired consistency and applied over color or directly onto glass with a brush, writer pen, stamp, calligraphy pen or any tool where you want fine detail on your glass artwork. They can also be mixed with White MUD for tinting. Firing range is 1425F-1550F (except for Green and that needs 1480F to mature) and COE range is 83-96. Detail Colors come in ½ oz. 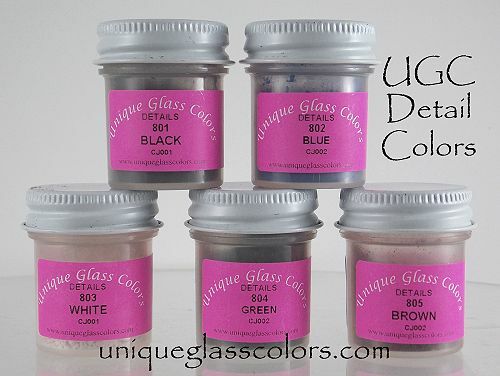 jars in five colors – Black, Blue, White, Green and Brown.